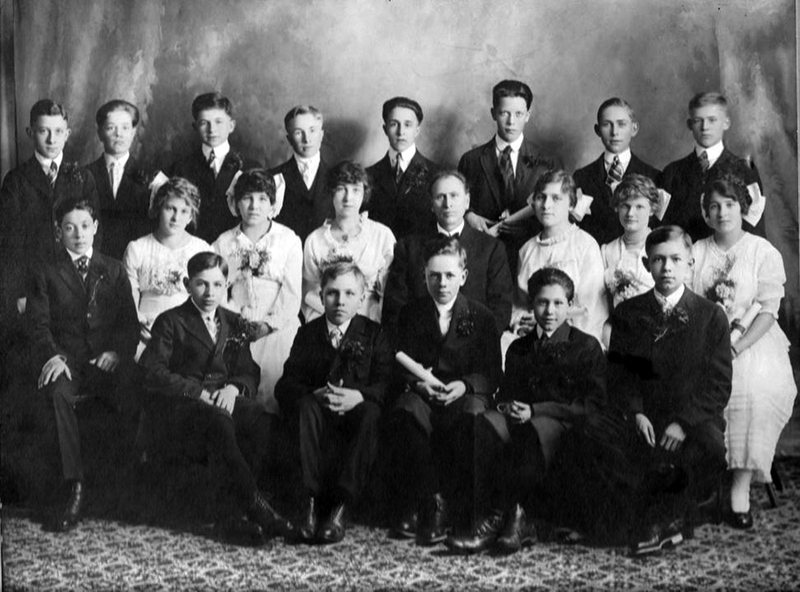 The April 1, 1917 Confirmation Class of the Free Evangelical Brethren Church. Front row from left to right: ?, Johannes (John) Wacker, ?, ?, ?. Middle row from left to right: ?, ?, ?, ?, Elder Peter Yost (not confirmed), ?, ?, ?. Back row from left to right: ?, ?, ?, Conrad Fink, ?, ?, ?, ?. The unidentifed class members are: Karl Leel, Heinrich Claus, Peter Sittner, Jacob Rotarmel, Ludwig Lehr, Wilhelm Mueller, Philipp Krieger, Johannes Mueller, Alexander Fruehauf, Heinrich Wirth, Heinrich Koch, Wilhelm Jost, Cristina Krieger, Liele Hoelzer, Edna Bauer, Emila Wacker, Markreda Koch, Elisabeth Schaefer. Please contact the webmaster if you have information about this confirmation class. Photograph courtesy of Dee Price. According to Dee Price, John Wacker is shown in the front row, second from the left, with hands folded and feet together. John was the son of Philip Wacker and was born on March 4, 1902 in Norka and died on February 24, 1932. Conrad Fink identified by his grandniece, Julie Malinosky.